I am still devastated with the news. I've always thought that we could give Ginger a better life than our neighbors. Now, I am second guessing myself. I was just there two weeks ago... and Ginger was fine-- albeit her reaction to the cold, which I thought was normal since they seemed to be handling the insane drops of temperature well. Last Sunday, we were at 15.5 degrees Celsius: the coldest this month. Was it because I wasn't there? Also, I found this really nice letter written by Sue Perkins to her dog, Pickle. Warning: Bitter-sweet content; Might make you cry; Prepare tissue. Haopee, please do NOT blame yourself for Ginger's passing. Ginger knew love with you and your Mom, and that is what matters. Thank you for loving her. Purrs and prayers to you, dear friend. Oh, dear. Losing a pet never gets any easier. I am sorry, Haopee. Mom Kim here - dear Haopee, please don't ever doubt your love and caring for your furry-legged family members. I can tell just by reading your blog that they are way more than just dogs or just pets. I went back and read about when you got Ginger - she was not in the best of shape then and no telling if her previous owner even kept her up to date on needed vaccinations or even got Ginger the most basic of vet care. No telling what any kind of care Ginger received from her previous owner. Before I had to help my Angel Oreo cross the Bridge he would spend most of his day out in the kitchen sleeping - I felt bad that I was not interacting more with him but he didn't want it. I am so sorry your heart is hurting. I know you feel so bad. Its not your fault,, not at all. 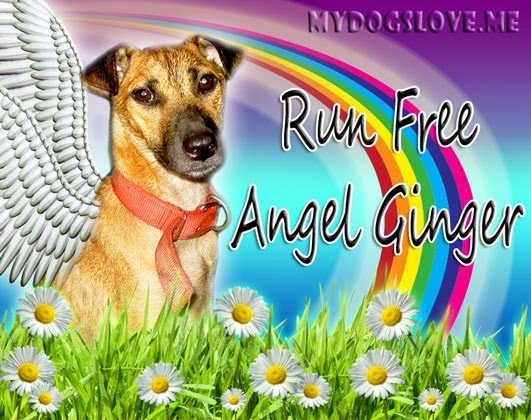 Run free sweet Ginger,,, run free. That's sad. Sounds like Ginger knew it was time to go. Our old Kendra hid when it was time. Don't beat yourself up. Hugs to you. I think it was Gingers' time. You should not beat yourself up about it. Run free and fast over the rainbow bridge sweet Ginger. Sending big hugs. I'm so sorry to hear about Ginger. Don't put the blame on yourself. Ginger was just needed at the Bridge for a job that only she was qualified to do, and she answered the call with dignity. She left you with her most precious gift of all....the wonderful memories. Keep them safely tucked away in your heart and everything will be ok. I am so sorry to hear about dear Ginger. Love and hugs from all of us. Please don't blame yourself. We all know you did your best to give her a good life. Just wondered in to say we are sorry. We never knew Ginger, but it is clear you loved her, and she surely loved you. Gentle headbonks to you all. I'm sad for you, but I'm sure she knew you loved her.